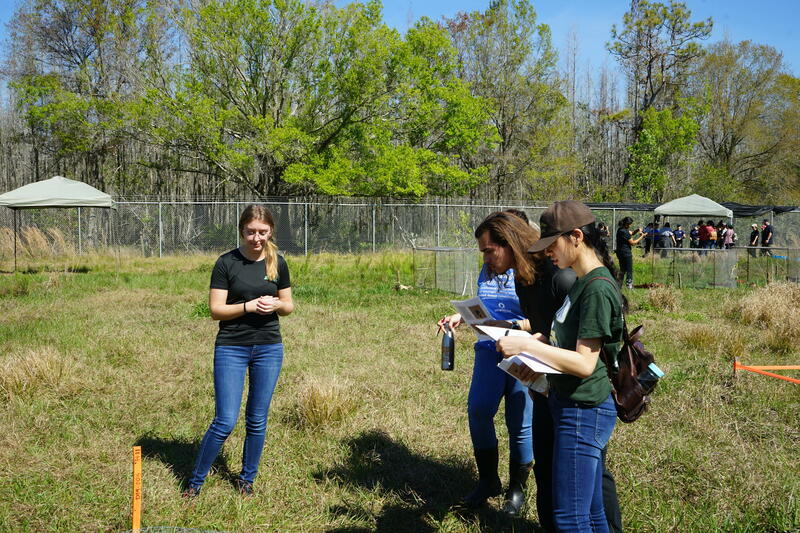 USF forensic anthropology students and FBI agents learn crime scene mapping skills at the annual field day at the Facility for Outdoor Research and Training (FORT). NOTE: Some of these photos include graphic content. The effect a decomposing body has on vegetation can be seen in the middle of this marked off section. The leg and foot of a donated cadaver shows the effects of the Florida environment on a body. In the background, students and agents look at a pair of bodies. In the foreground are cadavers that are normally protected from predators like vultures by cages that were opened for the field day. In earlier versions, they’d meet on the Tampa campus or on the nearby grounds of MOSI and look at how the bodies of buried pigs decompose in Florida’s climate. But for the past few years, they’ve actually had a dedicated field – and real human bodies – to study. 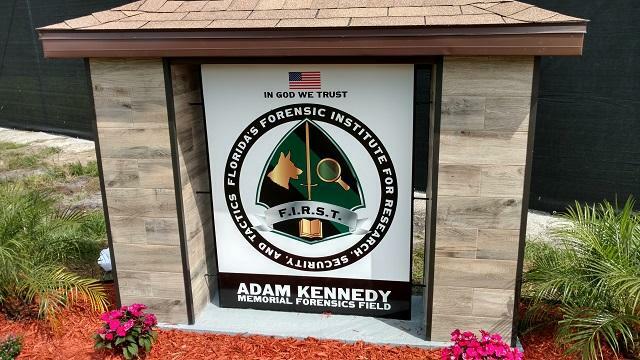 University Beat report on the USF Forensics - FBI field training day. NOTE: Some of the language in this story may be uncomfortable to hear. The location is the Facility for Outdoor Research and Training, or FORT. 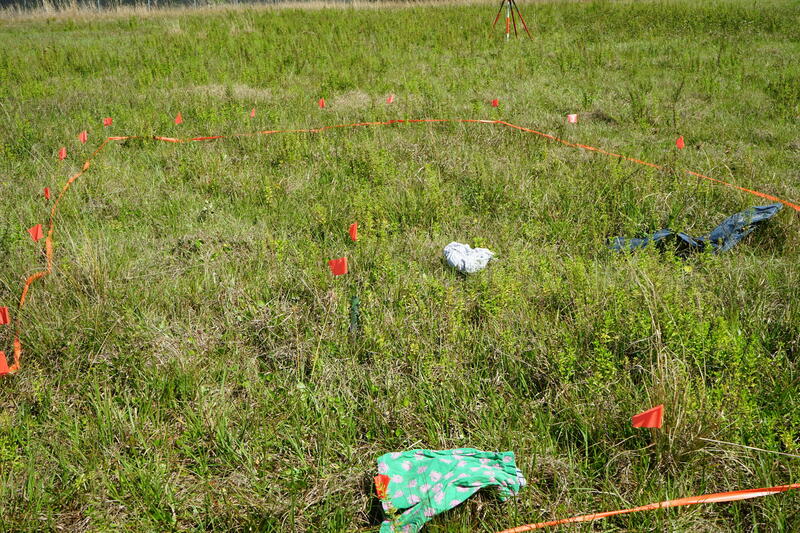 It’s a fenced-in three and a half-acre field on ground donated by the Pasco County Sheriff’s Office, and the subjects are people who chose to give their bodies to forensic research after their deaths. The field is named for Adam Kennedy, a local elementary school principal who became one of the first donors in 2017. It’s also known as a ‘body farm’ because the cadavers are placed in various settings throughout the field so visitors - both students and law enforcement from across the state and country - can observe for themselves the effects our subtropical environment has on the bodies. It's the seventh such facility in the nation and the first in Florida. Forensic anthropologist Erin Kimmerle is the director of the Florida Institute of Forensic Anthropology and Applied Science at USF, which operates the facility. “I think the way in which people learn best is hands-on and very practical. And I think that being able to be out here and work with real human cadavers and integrate the research that we've been doing into the training is critical,” she said. During the training day, two separate sessions with multiple courses for the 45 undergraduates and dozens of FBI agents are held. WUSF was the only media outlet invited to observe. NOTE: Video includes graphic content. In one section of the field, one group of students and agents circled two bodies on the surface. The naked subjects were enclosed by chicken wire to protect them from predators like the vultures that circle the field. The undergraduates quizzed graduate student Gennifer Goad about different things they observed – the color of the skin and fluid, the color of the grass around the bodies, even the flies and other insects that are surrounding the bodies – all in an effort to determine how long the subjects had been in the field. There was an odor of decomposition in the air, but if it was bothering any of the students, they didn't show it, instead furiously scribbling their observations on notepads. A student uses total station surveying equipment to study the mock crime scene. And the work at the FORT during the Field Day is not just limited to scrutinizing bodies. FBI trainers set up mock crime scenes to show how investigators have to precisely log every detail. She said it’s that extreme precision that surprises forensic science students more than encountering their first decomposing body does. "Evidence" at a mock crime scene set up for the Field Day. But she adds that this kind of well-rounded personal experience is extremely important in a student’s learning process. “We show them videos and photos and we talk a lot about the sort of things are doing out here, but it's never quite the same as when they get out here and see it firsthand. And I think that's what they really appreciate and love, because now it all becomes very real and they understand it in a way that just reading about it, you'll never get,” she said. Senior Dominick Ramirez, who is considering following in the footsteps of his father, a retired New York Police officer, agrees. For Ramirez, the entomology lessons were the most surprising. But for classmate Tina Van, the smell of decomposition is what she took away from the experience. And student Kathia Tatute said the generosity of the people who donate their bodies to this work stuck with her. Kimmerle said, so far, 36 bodies have been donated and another 150 people are registered to donate when they die. After the bodies decompose, she said they become part of a permanent skeletal collection at USF that visiting scholars from around the country and world come to research. People interested in donating can visit the USF Human Donation Program here. USF forensic anthropology student Gennifer Goad, left, talks to students, including Dominick Ramirez, leaning forward, about the cadaver they're observing. If what he says is true, Samuel Little would be one of the worst serial killers in U-S history. The 78-year-old claims that between 1970 and 2005, he murdered 90 people, mostly women, around the country. That includes some in Tampa, Plant City, and elsewhere around Florida. Now investigators, including University of South Florida forensic anthropologist Erin Kimmerle, are trying to determine the validity of Little’s claims, as well as the identities of some of his victims. 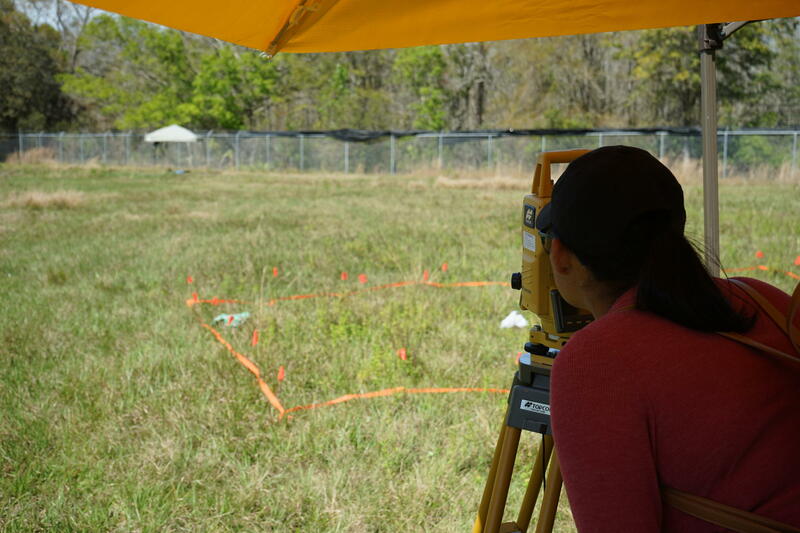 The University of South Florida announced late Friday afternoon that the USF Forensic Anthropology Laboratory will find an alternate location to train students and law enforcement to process human remains in outdoor crime scenes. 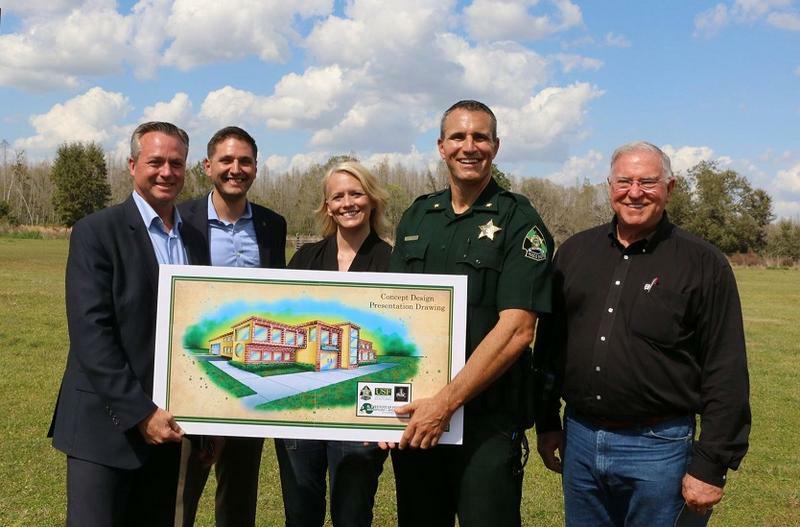 The Facility for Outdoor Experimental Research and Training (FORT) program was proposed on Hillsborough County Sheriffs property in Lithia, but an outcry from residents about possible smells, groundwater contamination and property values prompted a change in plans.